Our summer season was pretty wild with two tropical storms and three hurricanes. 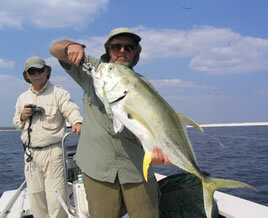 But as always, we had some great times on the water and caught some nice fish. For additional photos visit the Photo Gallery Winter 2006, the Photo Gallery Winter 2005, the Photo Gallery Spring 2005, and the Photo Gallery Fall 2005. 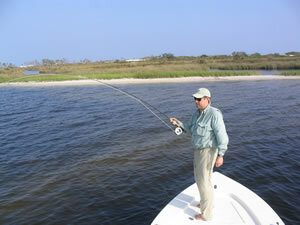 Feather-Craft's Bob Story, fighting a redfish in a lovely setting. 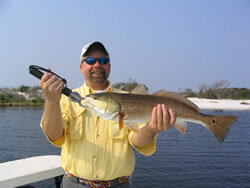 The redfish exploded on a F-C white baitfish popper. Bimingham's Bruce Cusic was casting a plug for sharks when this twenty pound jack crevalle took control of the situation. We revived the jack and released it unharmed. 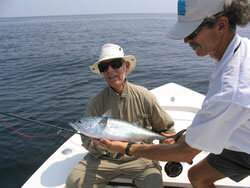 Freddy Loef from Athens, GA landed this false albacore (a.k.a. bonito) after numerous runs into the backing of his ten weight outfit. 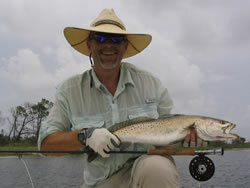 A terrific speckled trout caught on a popper by Birmingham's Glenn Perry. 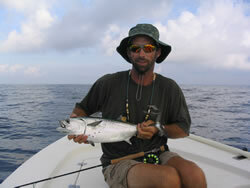 Jeff Nall of Nixa, Missouri and a catch-and-release false albacore. Matt Neal, taking a break from college at Birmingham Southern, brings home the family dinner. 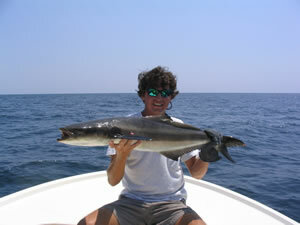 Matt Neal and a surprise cobia landed while snapper fishing on close-in structure. 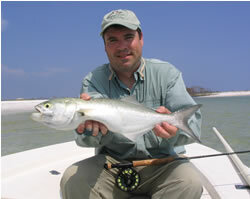 Bob Story and one of about twenty bluefish caught on a Feather-Craft white baitfish popper. Excellent grouper caught in the bay by Captain Baz's nephew Matt on a Fourth of July family trip. 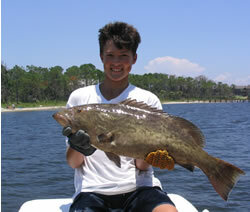 Niece Rachael's grouper caught on the same family trip. 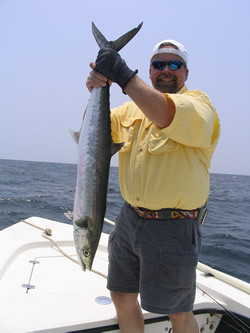 The first king mackerel of the summer season landed by Mitch Wayte of Wichita Falls, Texas. 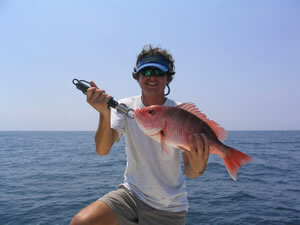 Mitch Wayte and a fine early summer redfish caught on a Zara Spook. Mitch rounded out his day with this (fins up!) 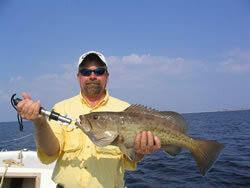 gag grouper. Check out the blue in this fish's tail. 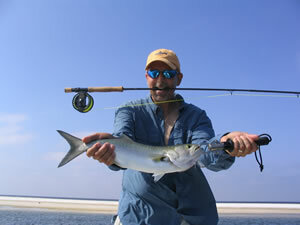 Lawrenceville, Georgia's Stephen Larson with an angry popper-caught and released bluefish.